Commercial dry foods are the ultimate “convenience food” for pets. They are manufactured by the same companies that make such foods for humans, specifically Mars (Masterfood, Uncle Bens, Royal Canin), Nestle (Nestle-Purina, Friskies), and Proctor and Gamble (Iams and Eukamuba). The other big player (Hills) is owned by Colgate Palmolive. These convenience food giants don’t just make staple diets, but also expensive treats (beef and chicken jerky and desiccated liver) that cost more per gram than fillet steak. The Australian Veterinary Association (AVA) has endorsed overseas policy guidelines that recommend feeding commercially prepared dry and canned food to cats and dogs. This is in stark contrast to how veterinarians and animal nutritionists feed carnivores in zoos. In zoos, big cats (lions, tigers, etc.) and wild dogs (dingoes, wolves) are fed predominantly fresh meat on the bone, to mimic what occurs in nature. Typically, whole chicken or turkey carcasses and portions (usually limbs) of cows and sheep comprise the major portions of the ration. Fresh meat, some offal and fresh bones are all normal food constituents in nature. This ration requires vigorous mastication, as is the case when a carnivore dines in nature. Eating such tucker is hard work but clearly pleasurable. When finally satiated, carnivores generally have a long nap. For ethical reasons, we cannot reproduce the thrill of “the kill” when keeping carnivores in captivity, but we can certainly reproduce the enjoyment of a “natural feed”. Tearing apart flesh and stripping it off the bone is a physiologic way to “floss”, reducing plaque and calculus which otherwise build up on teeth. The mouth and digestive system of carnivores has adapted over millennia to this type of diet. 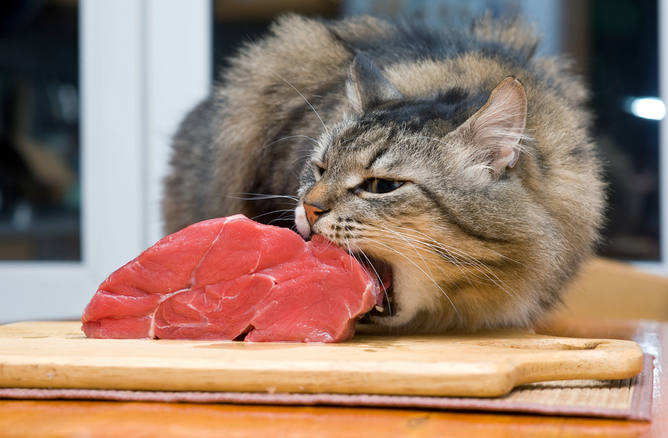 Cats, like their larger relatives, are hypercarnivores – carnivores who have evolved through natural selection to eat the flesh and bones of prey animals exclusively. The only carbohydrate normally eaten is in the liver and intestinal tract of prey. Dogs are carnivores, although they have less stringent nutritional requirements. One might therefore think that the ideal food for cats and dogs would include regular portions of fresh meat on the bone. Why then are most commercial foods for cats and dogs dry extruded rations based on plant carbohydrates, with added fat, minerals and hydrolysed protein? And why do most veterinarians recommend such diets? My view is that our profession has been misdirected by the exceptionally clever marketing of multinational pet food manufacturers. In the human arena, such companies are often called “big food” and “big soda”. Dry extruded diets are clean, convenient, have a long shelf-life, are easy to serve and store. They don’t need to be bought fresh every few days. They contain a lot of goodness and are balanced for vitamins, minerals and macronutrients. Indeed, as a component of a balanced diet, “premium dry food” has much to offer (more for dogs than cats and particularly for growing animals). But they tend to be consumed quickly, with little effort. If they are fed without careful portion control, you quickly end up with a fat pet. The coating with tasty oils makes this food irresistible, just like salted potato crisps are to us. But it doesn’t have the physical qualities to remove calculus from teeth and many have excess carbohydrate and insufficient protein, especially for hypercarnivores. Cats fed these diets exclusively have the propensity to develop diabetes, obesity and osteoarthritis. Pet food manufacturers provide most of the money for nutritional research in companion animals. They thus control the research agenda, and the “evidence base” for canine and feline nutrition. They donate money and products and sponsor functions at veterinary schools, thereby subliminally influencing the feeding practices of impressionable young vets and their teachers. They fund also clinical nutrition lectureships and residencies. University management appear unconcerned by this arrangement. Pet food companies also sponsor seminars, webinars and sessions at scientific meetings. They run advertisements in leading veterinary journals and are a major sponsor of the AVA. The final masterstroke of pet food companies is that they enlist veterinarians to actually sell, and thereby endorse these diets, right in the waiting rooms of their hospitals. It doesn’t need to be this way. The concerted efforts of a number of forward-thinking veterinary scientists have meant that Australasian pet owners probably feed more raw meaty bones as part of a balanced ration than in many countries overseas. This is commendable. But we have some way to go.